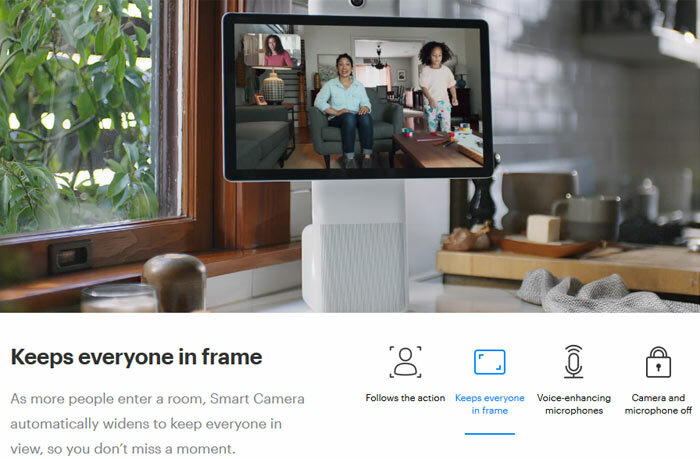 Facebook has launched a couple of new smart devices which enable AI-powered video calling in your home. 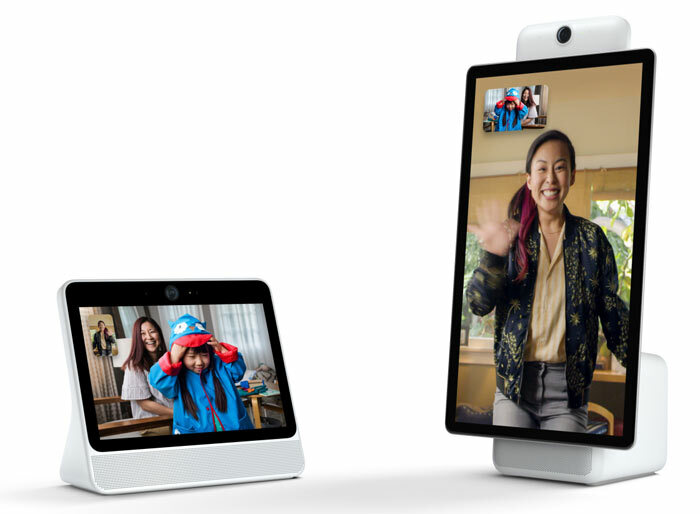 The Facebook Portal and larger Portal+ can be described basically as smart speakers with screens, with features competitive to the Amazon Echo Show. As well as facilitating immersive chats with Facebook friends and family in groups of up to seven, the device offers voice control plus Alexa, various apps, and the promise of privacy and security. Looking more closely at the hardware on offer the Facebook Portal provides a 10-inch HD screen, and the Portal+ a pivoting 15-inch Full HD display. The USP of these devices centres on the AI technology backed cameras. Facebook asserts that the smart camera and smart sound in the devices deliver an immersive and “more convenient, hands-free experience”. Most importantly the smart camera will pan and zoom and follow you around a room as you converse. Simultaneously the audio system filters out background noise and enhances voice. Unsurprisingly Facebook installs a version of Messenger on the Portal devices and you can converse freely with other Messenger users whatever platform they might be on. Using voice control you can easily begin a call – just say “Hey Portal, call_____”. Portal has Amazon Alexa built in for plenty of extra functionality like asking for sports scores, about the weather forecast, controlling smart home devices, ordering gifts and groceries, and more. Shared experiences are an area that Facebook sees as a workable niche for the Portal devices. It has pre-loaded apps that allow joint-enjoyment of music and shows from the likes of Spotify Premium, Pandora, and iHeartRadio, as well as Facebook Watch, Food Network and Newsy. Users can also enjoy AR effects powered by Spark AR in the calls, with visual and sound effects applied – great for story time, says FB. 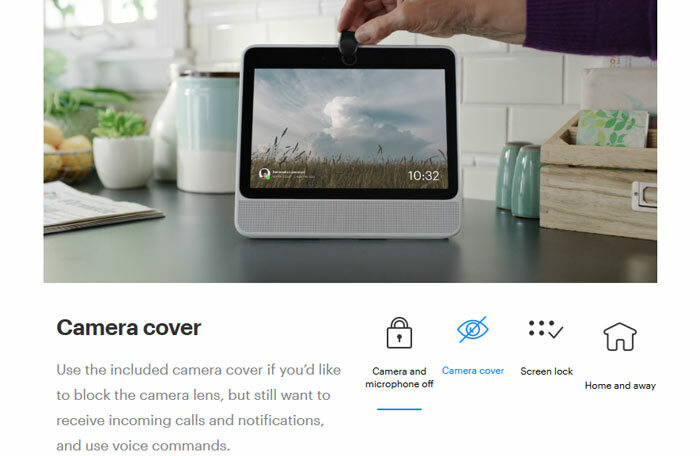 Facebook assures those interested that the Portal devices are “built with privacy and security in mind”. Above you can see the hardware camera cover in action and you can disable the camera and mic in software with a single tap. Portal access can be secured with a four to 12-digit password. To try and calm your privacy concerns Facebook says it doesn’t listen to or keep contents of your (always encrypted) video calls. Furthermore, the AI tech runs locally and only commands after the initial ‘Hey Portal’ get sent to Facebook servers for processing. 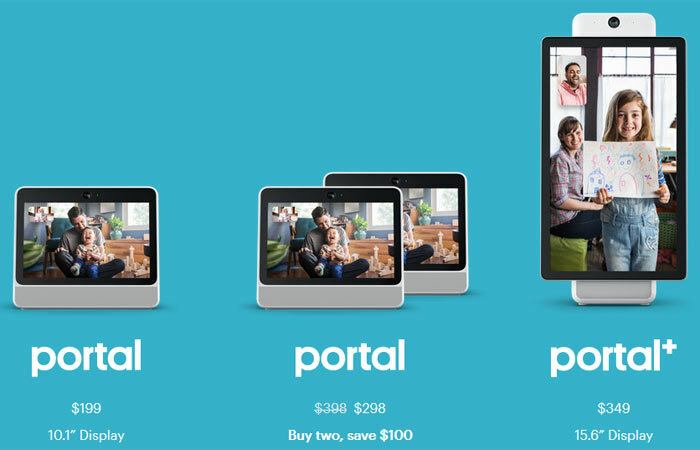 The Facebook Portal and Portal+ is available to pre-order now, starting from US$199. Shipping starts from 12th Nov. The worst thing about these isn't the waste (a £200 display that only does one thing that your phone/tablet does already,) or the privacy issues (its Facebook, really think that mic is off?) It's the fact that it encourages the heresy that is vertical video! The worst thing about these isn't the waste It's the fact that it encourages the heresy that is vertical video! No, it's the fact that you don't get an Orange hole and a Blue hole, through which you can get a cake delivered. One might go so far as to say that, with this particular Portal, the cake really is a lie!! I think most regular users here will have no difficulty predicting my reaction to this, or the chances of me ever using one, let alone buying one. I don't even use Facebook, probably for some of the same reasoning. I definitely wouldn't touch this with a barge pole. Considering recent events that have come to light in terms of data etc, I feel entirely justified in choosing not to touch Facebook.